Molly Jacobson is a writer and also the editor of The Dog Cancer Survival Guide, published by Maui Media. A lifelong dog lover and self-professed dog health nerd, she is all too familiar with dog cancer. She has been supporting readers of this blog since the beginning. Molly earned a BA from Tufts University, and after a career in bookselling and book publishing attended The Swedish Institute to become a licensed massage therapist in New York State, licensed by the medical board. Her fascination with health is both personal and global, and she is most proud of how this site and the associated publications have revolutionized not only our approach to dog health, but our own health. Many of the strategies Demian Dressler, DVM (Dr. D) and Susan Ettinger, DVM, Dip. 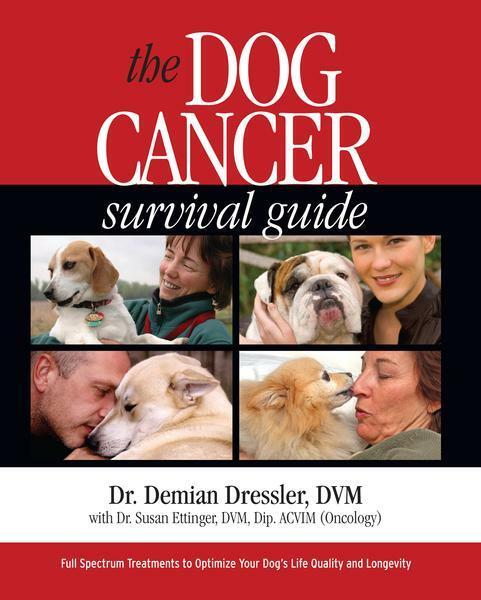 ACVIM (Oncology) (Dr. Sue) recommend in their best-selling book The Dog Cancer Survival Guide have potent effects on the body. For that reason, the authors really want you to find a veterinarian before you make any changes to your dog’s diet, medications, or supplements. But what if your vet isn’t interested in doing something new? What if you walk out of her office feeling dismayed and betrayed? How Do You Find a Veterinarian? Yikes. That’s a thorny question, isn’t it? And politically touchy, too. After all, we have to like — or at least trust — our veterinarian. But humans are humans, so … not everyone likes the same vet. What sounds like a joke to one person sounds like a rude and smart-aleck comment to another. A warm and authoritative tone to one person sounds like a domineering jerk to another. A sweet, friendly, and interested question to one sounds intrusive and overly emotional to the next. The fact is, even though your veterinarian has authority and training in their field, YOU are in charge. You are the one paying for their services. That makes YOU the boss. If your vet isn’t cutting it — either because she’s too dismissive, he’s not open-minded, or you just don’t feel like he or she is the right fit — you should find a new veterinarian. Let’s explore this a little. Your own general practice veterinarian is a good place to start, even if you don’t want to see them anymore. Yup, it’s true: you can ask your own vet. Don’t be afraid. This is your dog’s health and your money! Most veterinarians understand that part of their business is having a good relationship with their clients, even clients who won’t be coming anymore. If asked, your vet should refer you to another professional with no fuss or outward upset of any kind. Anything else would be unprofessional. Remember, vets want what’s best for your dog, too. They would rather see your dog get someone else’s care than no care at all. Veterinarians typically know other veterinarians in their area and can recommend someone who might fit you and your dog better. Your own veterinarian can also recommend a veterinary oncologist or a complementary (alternative or holistic) veterinarian for second opinions. If your veterinarian can’t or won’t refer you to another veterinarian for a second opinion or for more care, you can find a veterinarian in your area on your own. It may take some research, but it’s worth it. If you’re anything like me, you know all the dogs in your neighborhood. Next time you are watching them sniff each other, look up to the other end of the leash and ask the human attached if they like their veterinarian, and why or why not. Sometimes other dog lovers have fantastic insights into the veterinarians in your area. Dog groomers, trainers, and even pet supply store staff all have experience with veterinarians in your area, and can often advise you as to who might fit you and your dog. Many folks think that a veterinary oncologist is not necessary when it comes to dog cancer, and I understand why. After all, in many parts of the country (including my own state) you can’t even find an oncologist near you. However, consulting with one is a good idea anyway. Here’s why. Veterinary oncologists are experts on conventional approaches like surgery, chemotherapy, and radiation. They spend all day, every day, thinking about cancer and treating it using these tools. So if you’re even THINKING about using these for your own dog’s case, getting an oncologist on your team is an excellent idea. Think about it: if your own doctor saw a weird spot on an X-ray, and suspected cancer, he wouldn’t grab a scalpel and perform the surgery himself. He’d refer out to an oncologist … someone with expertise and much more experience. If your doctor saw a weird spot on an X-ray he wouldn’t grab a scalpel and perform the surgery himself. The same is true for dog cancer. While the general practice veterinarian can handle a great deal of cancer care, including many surgeries, diet, nutraceuticals, supplements, and lifestyle management, she can’t usually provide chemotherapy or radiation therapy. There are a lot of surgeries that really should be handled by a surgeon, too. You might think a specialist is too expensive — but maybe not. It may actually save money. Please keep in mind that there are just under 400 oncologists in North America (including Canada) and nearly 60,000 general practice veterinarians. Don’t be surprised if you can’t find someone in your local area! If you can’t find a local oncologist, your own veterinarian can often consult with one over email or phone. Your veterinarian will know how to contact an oncologist for advice, and it’s your right to ask him or her to do so. There are many veterinarians who are “going beyond conventional” these days. These veterinarians may focus on herbal preparations, acupuncture, supplements, and dietary recommendations, among many other options. They may call themselves “alternative,” “natural,” “holistic,” or some other term. We refer to them as “complementary” because we like to think that their services complement conventional veterinary care. Everyone can work together — and everyone should, right? If you’re looking for in-depth advice on any part of Full Spectrum care that isn’t related to surgery, chemotherapy, or radiation, consulting with a complementary vet is a good idea. Many have already worked alongside local oncologists. Some even do phone and email consults, which means your veterinarian could ask them for an opinion, or you could consult with them at a distance. Hopefully, your research will turn up at least one, if not several, great leads for your new veterinarian. You may be ready to book an appointment right away, just based on word of mouth. That’s great! However, if any part of you is skeptical about a new veterinarian you haven’t seen before, ask their staff if you can get a quick phone call from the doctor BEFORE your appointment. Explain that you just want to have a quick conversation and ask a few questions before you come in, just to make sure it’s a good fit. Most veterinarians are happy to spend ten minutes on the phone with a new client to chat about your dog, what you think you need, and how they work. This quick call or meeting is a great way to establish a relationship between the two of you. You can suss out whether they are a good communicator, and whether you feel they are trustworthy. It also telegraphs to the veterinarian that you are a concerned, involved, and “good” client. Do you treat this condition at your clinic, or refer out? How do you feel about making nutritional recommendations? What about using supplements? Do you have any special training or certifications I should know about? Do you go over costs up front, so I can make informed decisions? If questions come up, are you or someone on your staff available by email or phone in between appointments? Do you charge for those? What kind of imaging equipment do you have at your hospital? Do you provide emergency care at your hospital, or do I need to go to another hospital in an emergency? If a veterinarian balks at questions or doesn’t want to answer directly, I consider that a red flag. When you first get to your appointment, make note of everything, including whether the place is easy to get to, how good the parking is, how friendly the staff is, and whether the waiting area looks clean and inviting. Notice how the veterinary nurses or techs treat you and your pup. Do they get down on the floor with your dog? Do they seem relaxed and open, or stiff and overworked? When you’re meeting with the veterinarian, do you feel like you have her undivided attention? Does it feel like he’s rushing out the door, or wants to? Do you like the way you feel around them, or are you left confused or upset? Do you feel like she answered all your questions, and spent enough time with you to make sure you had everything covered? Are costs reviewed with you, so you know what to expect at check out? Does someone call you the next day to see how your appointment went, answer questions, and follow up on home treatment plans? When we call or visit the vet, we’re often distracted and confused and overwhelmed, so go prepared. Write down ALL of your questions, even the ones that seem obvious to you. That way, you won’t forget something important and feel weird about asking later. Also, after your visit, make sure to sit down and make a list of new questions that came up for you. We always recommend using a journal to track your dog’s cancer journey. Is this cancer rare, or common, and how many cases have you personally seen? If this treatment works, how much time will it gain us? If this treatment works, how much quality of life will it gain us? Are there any supplies or over-the-counter medications I will need at home for after-treatment care? How do I know if a side effect is severe enough to warrant a call for emergency care? How likely is that to happen? Do you think my dog is in pain? How will that be treated? Can I have a copy of my dog’s files and images? There are dozens more questions included in the chapter called “Working with Professionals and Loved Ones” in Part IV: Making Confident Choices. Look for those questions to start on page 260 of The Dog Cancer Survival Guide. The hands-down best resource for anyone dealing with dog cancer. Just like dogs, humans are social creatures. We like to be part of a “pack.” So don’t be afraid to ask other health practitioners and veterinarians to be part of your pack of caregivers for your dog. It will help you to feel secure in your decisions and avoid regrets later. Even just a courtesy conversation with a new veterinarian can help you to gain confidence in your plan. Get help. Your dog is worth it! YES!! So true. That’s worthy of another article.